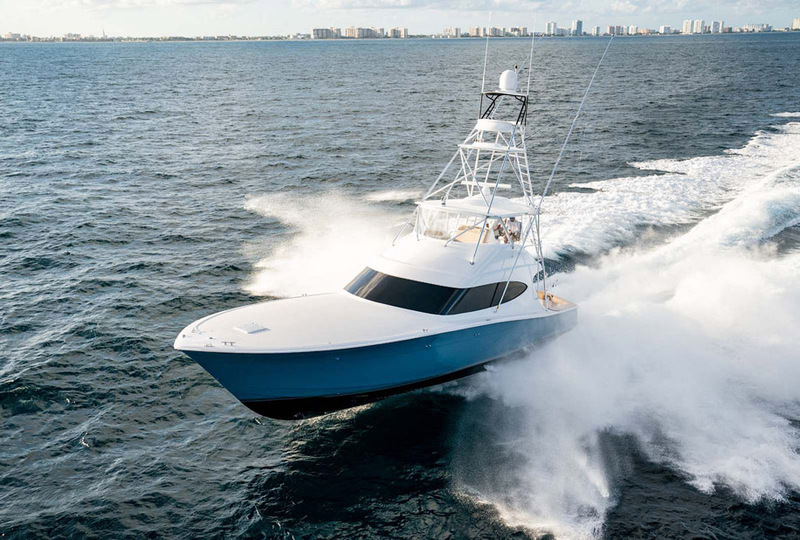 Designed for speed and built for battle.  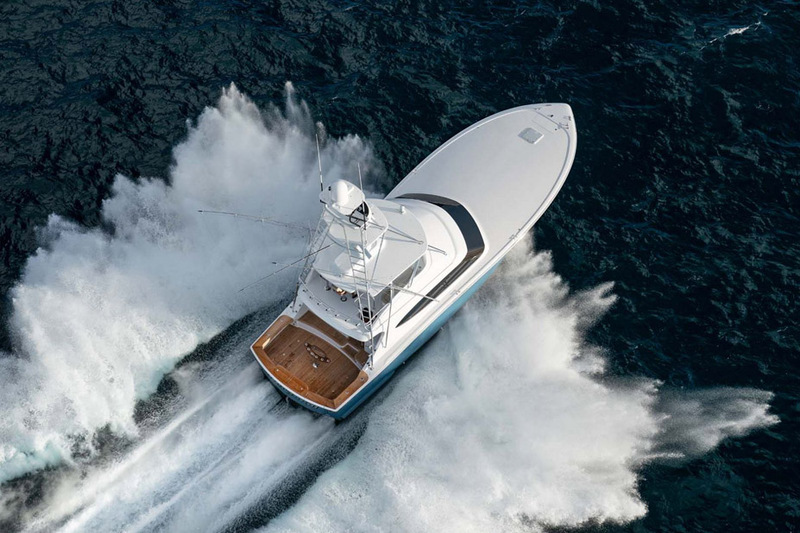 This was the mantra that Hatteras designers took from owner feedback when building a sportfish for the 55 to 60-foot market. 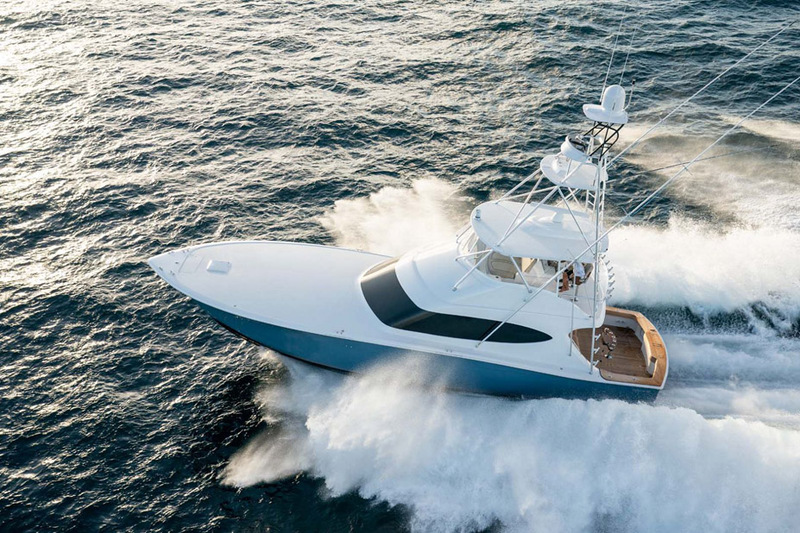 The new Hatteras GT59 is built for the serious billfish tournament angler with 40-knot plus speeds, amazing performance, and all of the fishing accessories you could ask for. 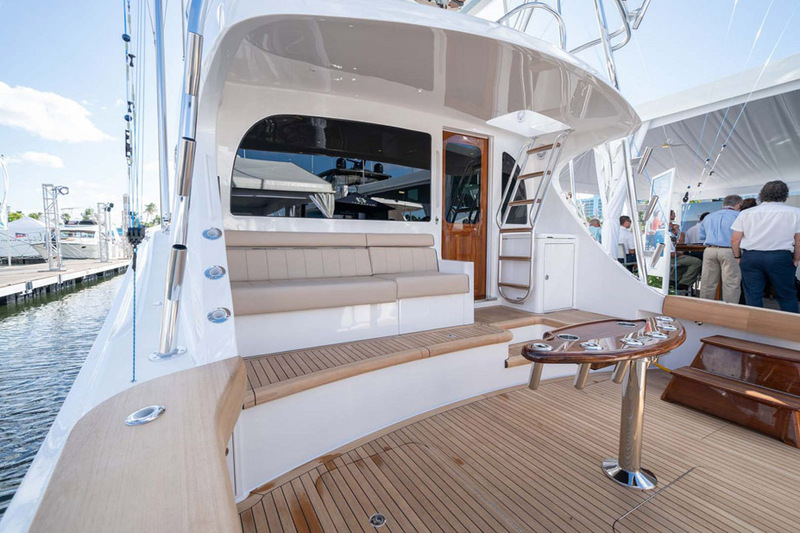 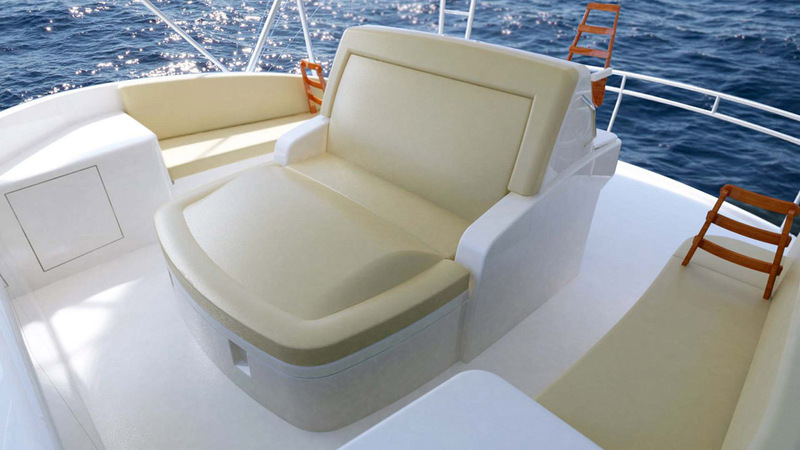 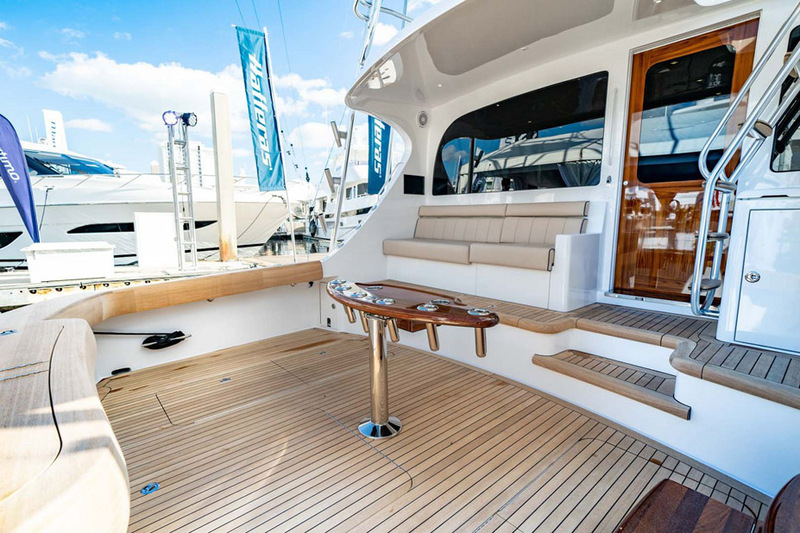 Yet like all Hatteras yachts, spending inside the boat changes the mood and atmosphere to one of a comfortable motor yacht. 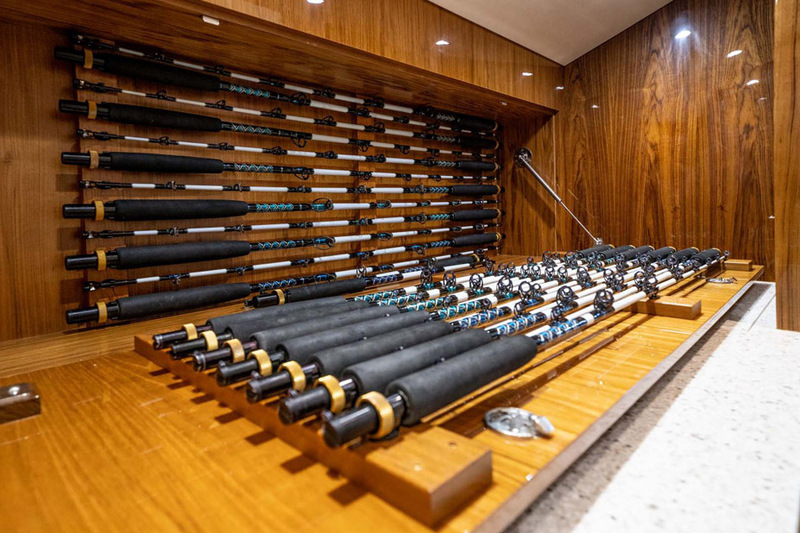 Because how can you fish effectively if you can’t sleep well at night? 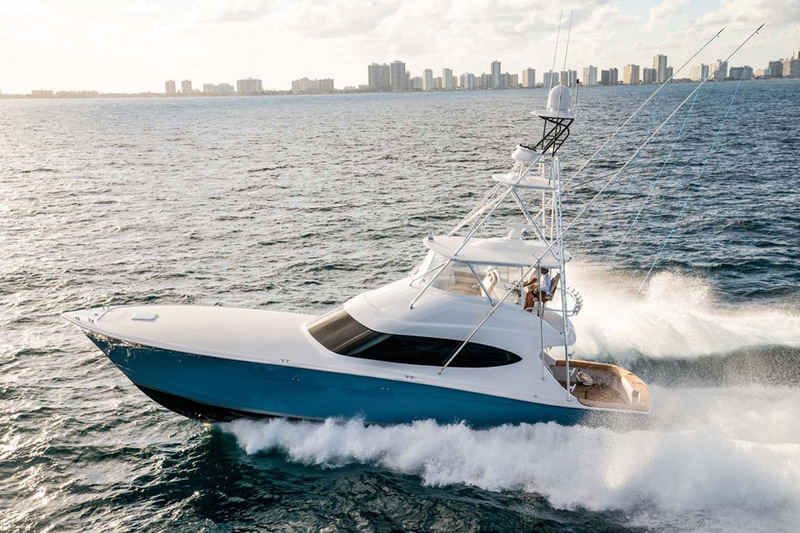 The Hatteras GT59 cuts through waves like knife as its uniquely shaped hull provides for quick planing and the specially configured chines keeps it dry, even in rougher weather. 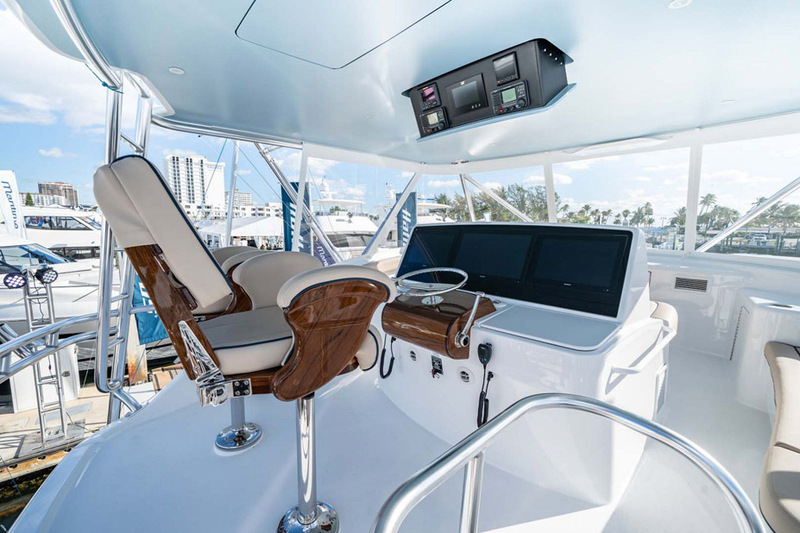 The GT59 comes standard with the twin Caterpillar C-32A 1600hp diesel engines which allow the boat to hit more than 40 knots with a cruising speed in the mid-30’s. 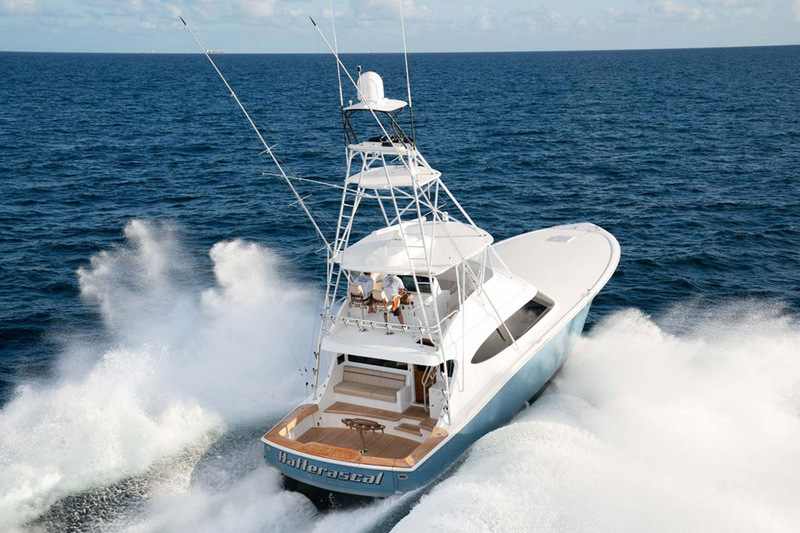 The fuel tanks can hold more than 1,700 gallons which is perfect for tournament anglers than need the extra mileage to make it to the fishing grounds quickly. 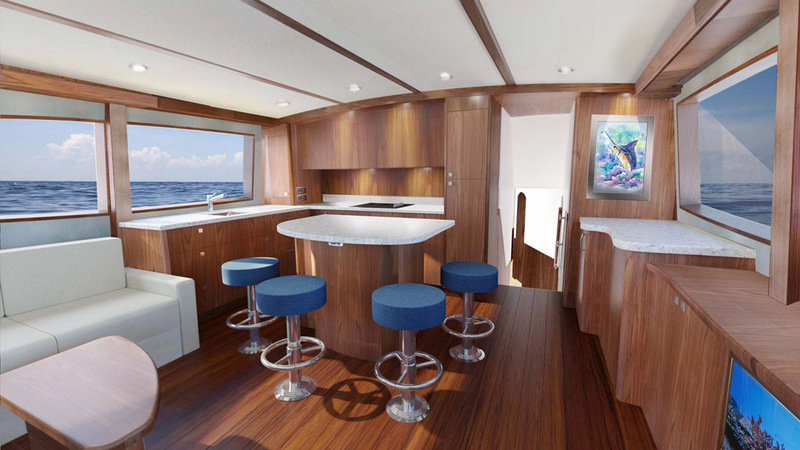 It’s that fit and finish in the salon and galley that becomes apparent once you walk inside. 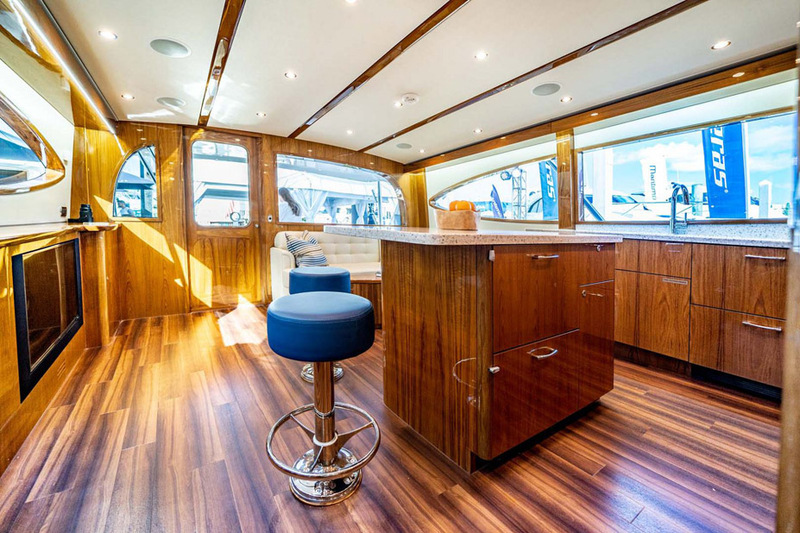 There is an open transition between the salon, galley and dining area which provides for a nice traffic flow throughout the boat. 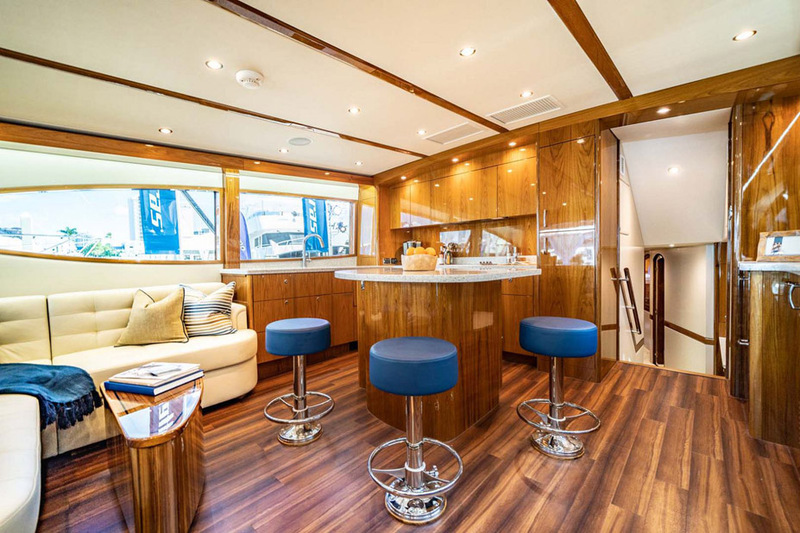 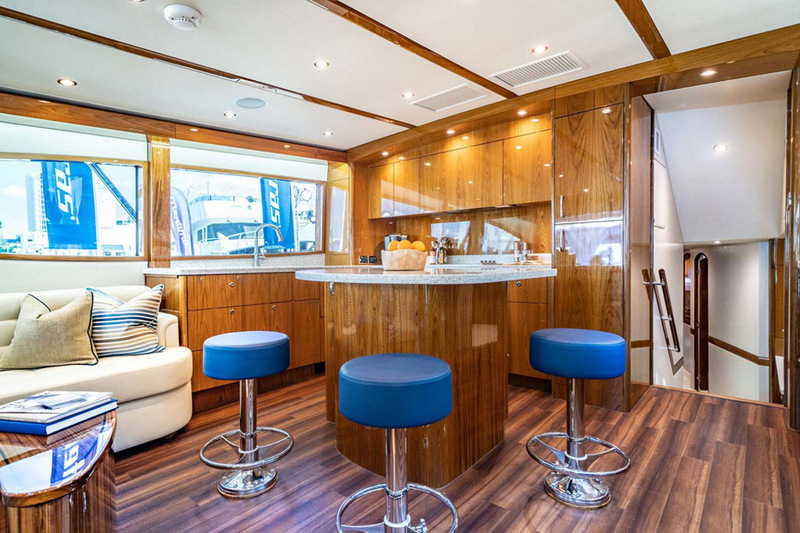 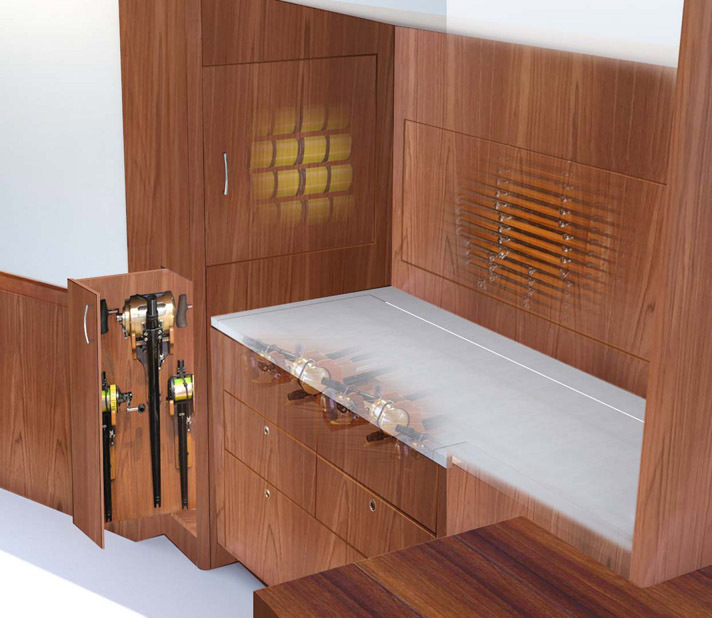 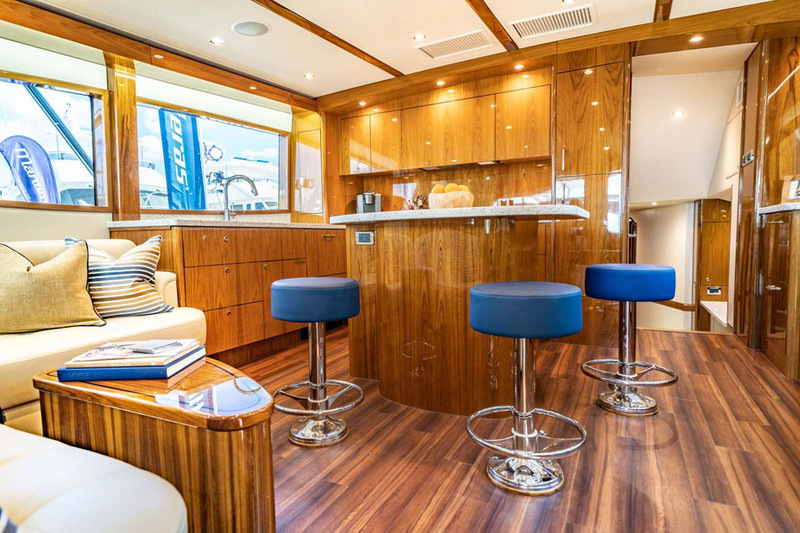 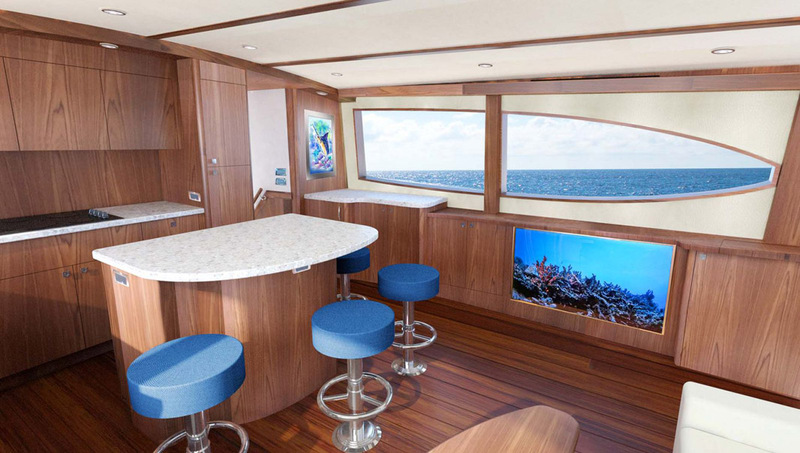 There is an island layout in the galley designed to facilitate moving throughout the boat without issues, particularly when there are a lot of guests inside and the boat is underway. 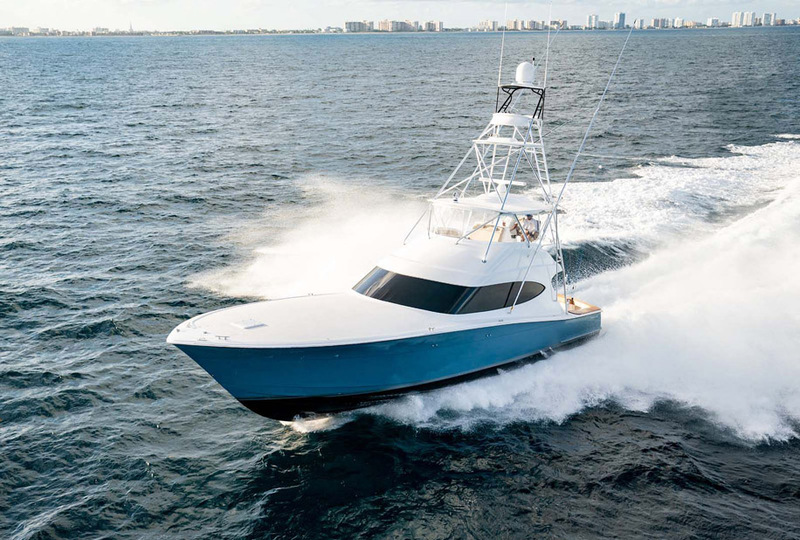 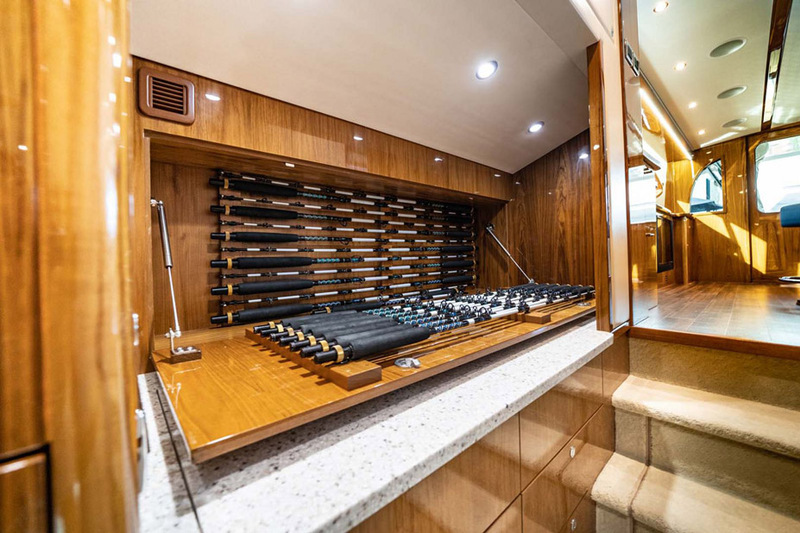 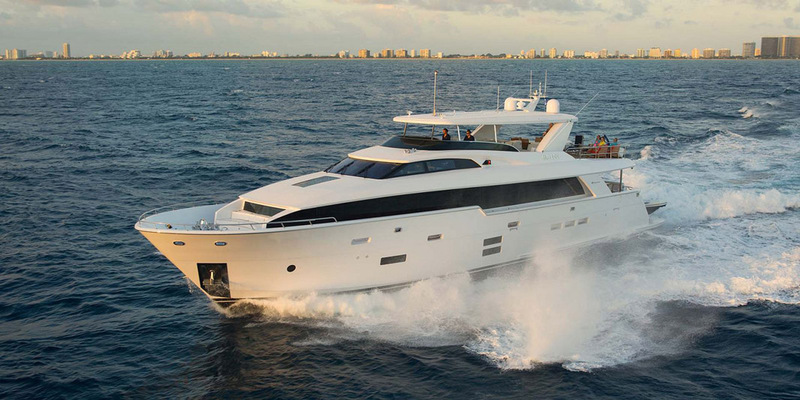 The finishes and amenities inside are luxurious, much like the Hatteras motor yacht line, which owners have come to expect from these high-end sportfish and cruising yachts. 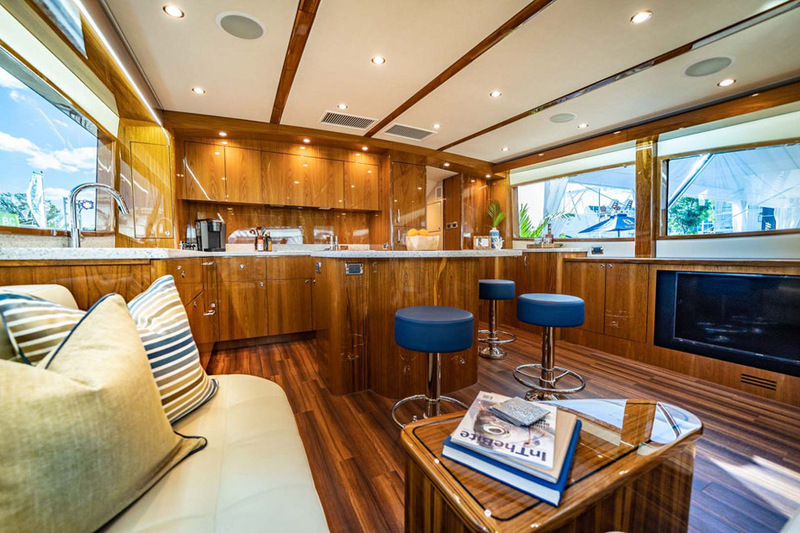 The popular 3-stateroom, 2-head layout gives owners a private master suite with private head and queen-sized berth. 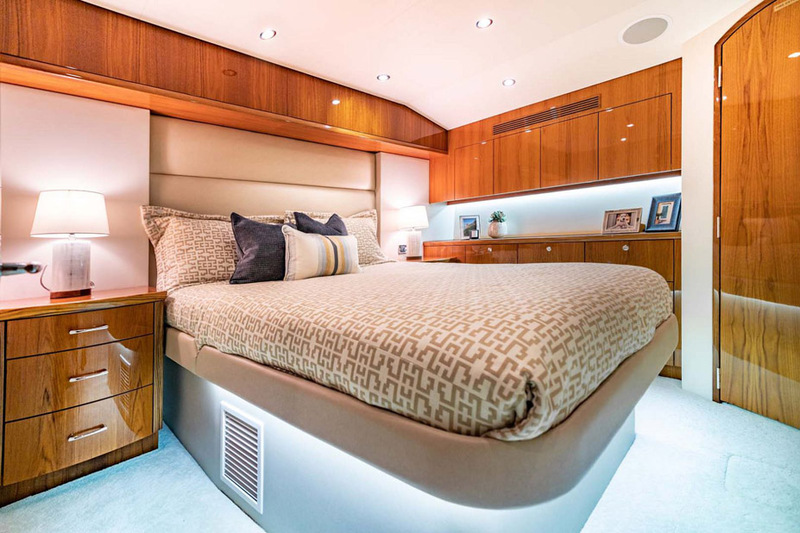 The two additional staterooms include a VIP suite with queen-sized bed and the other with over-and-under bunks that kids on board will love. 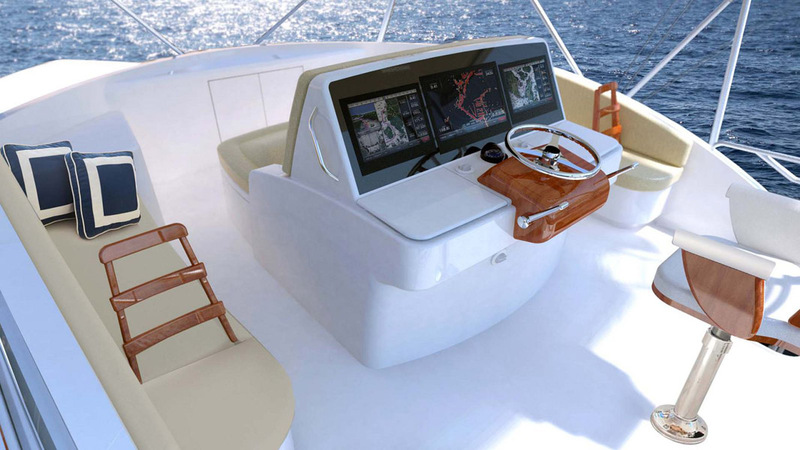 Perhaps the most important area of the boat is the cockpit where all of the action happens. 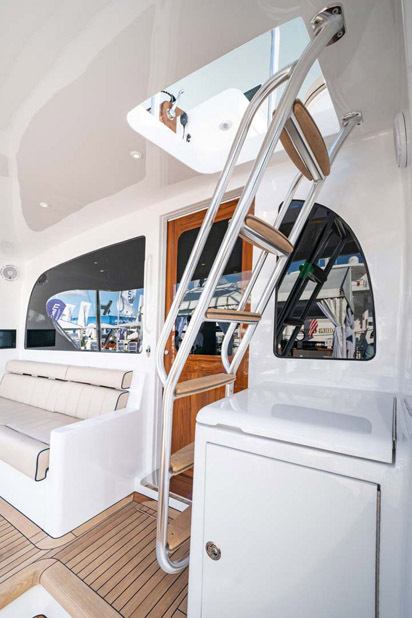 The 153-square foot cockpit has full mezzanine seating for guests wanting to watch the fight along with a bevy of fishing features. 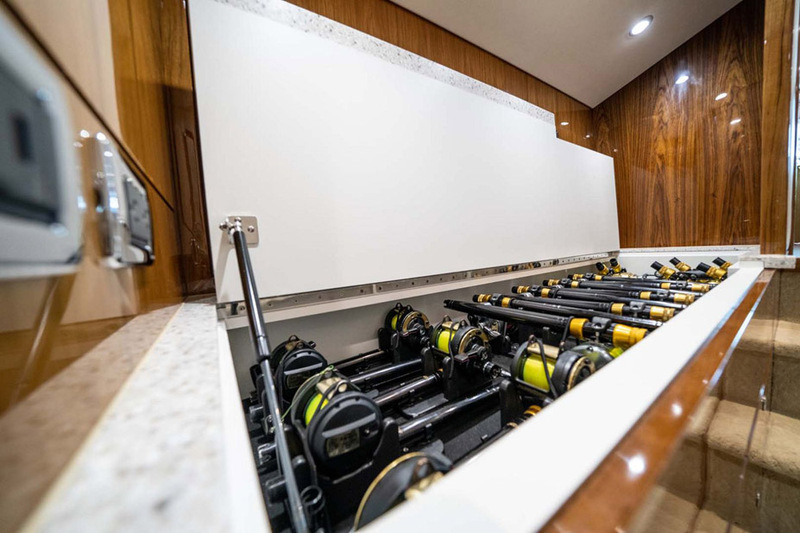 There is ample space around the fighting chair for mates to move around during a tournament and there is plenty of tackle and bait storage, rod holders, fish boxes, and molded-in transom livewell to appease the toughest of anglers. 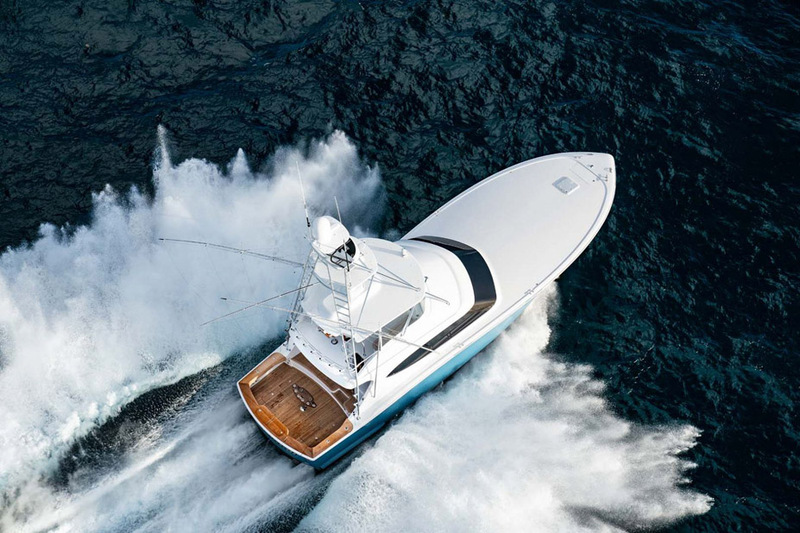 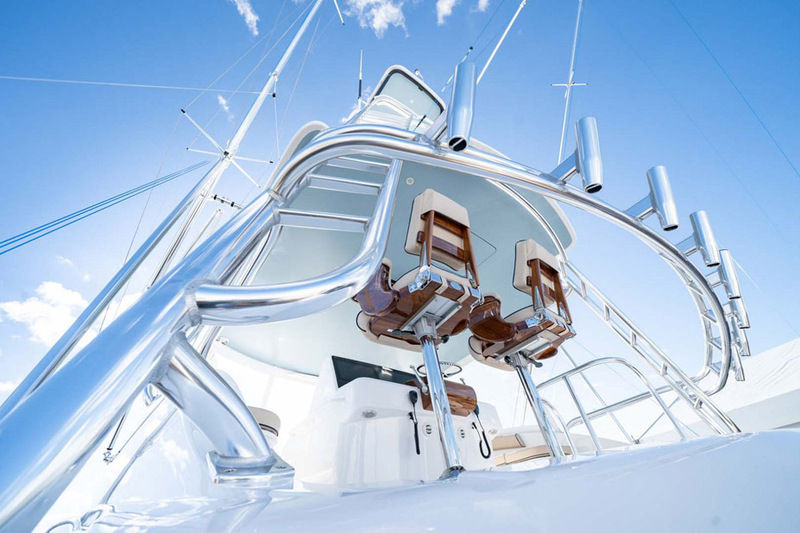 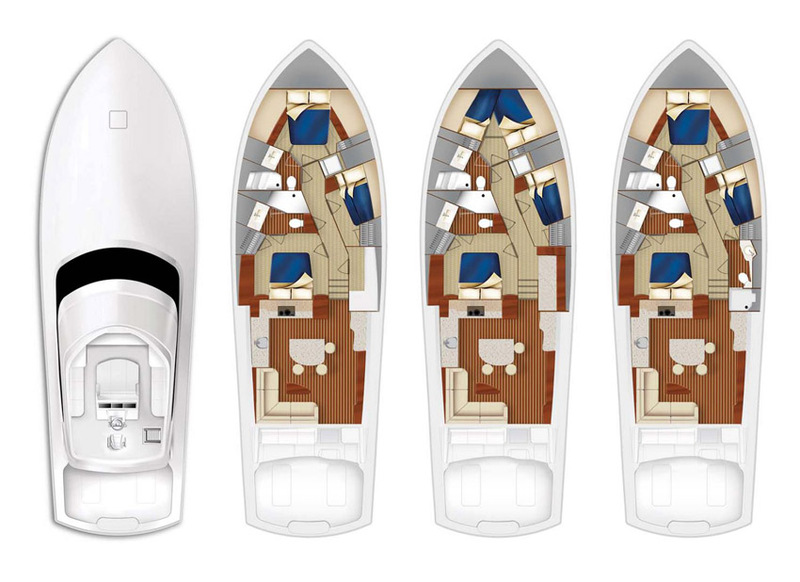 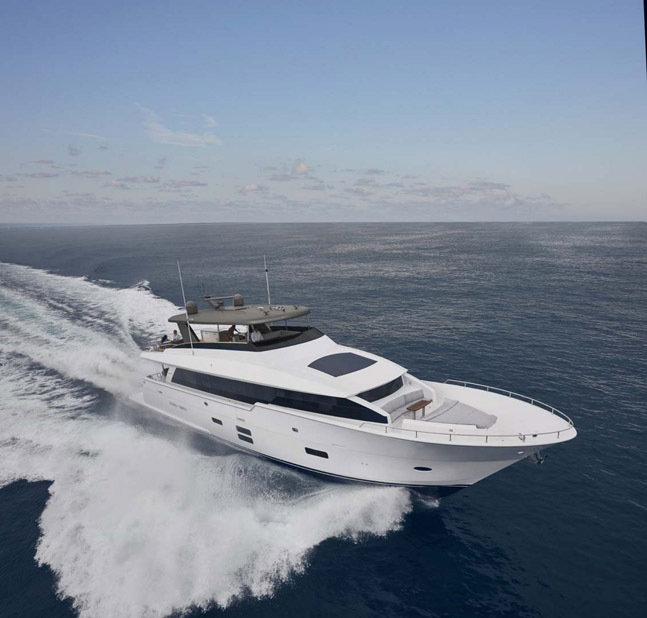 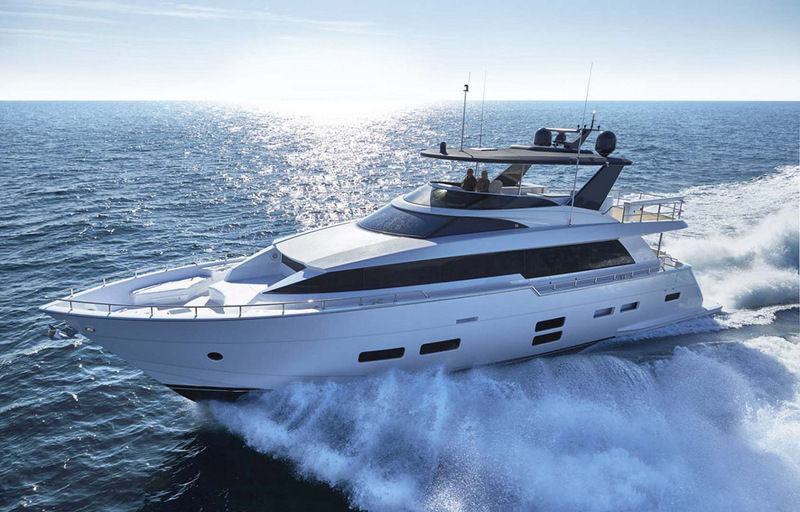 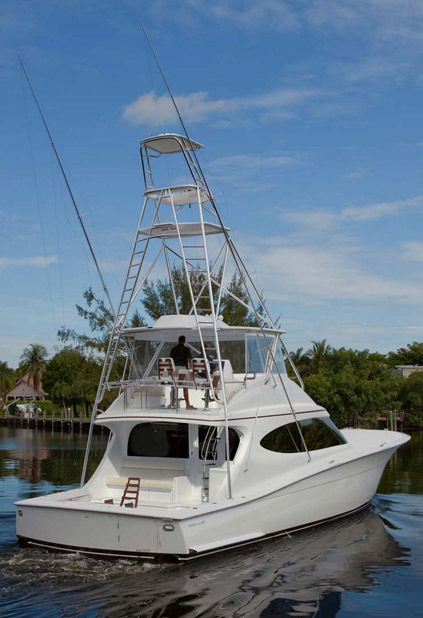 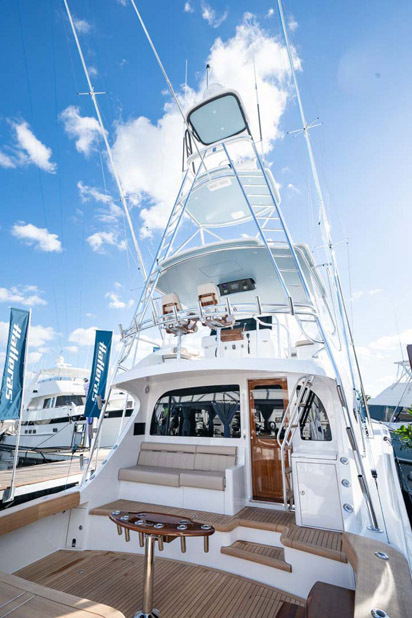 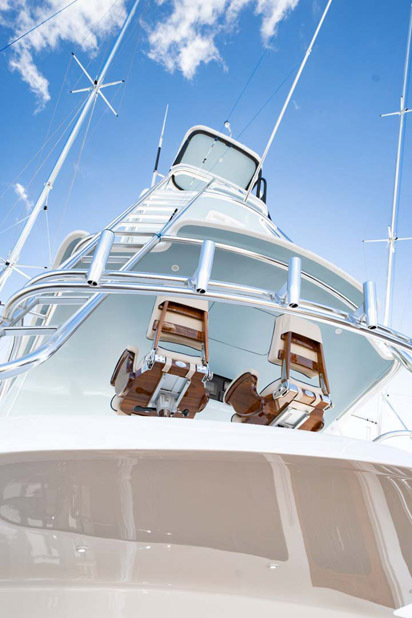 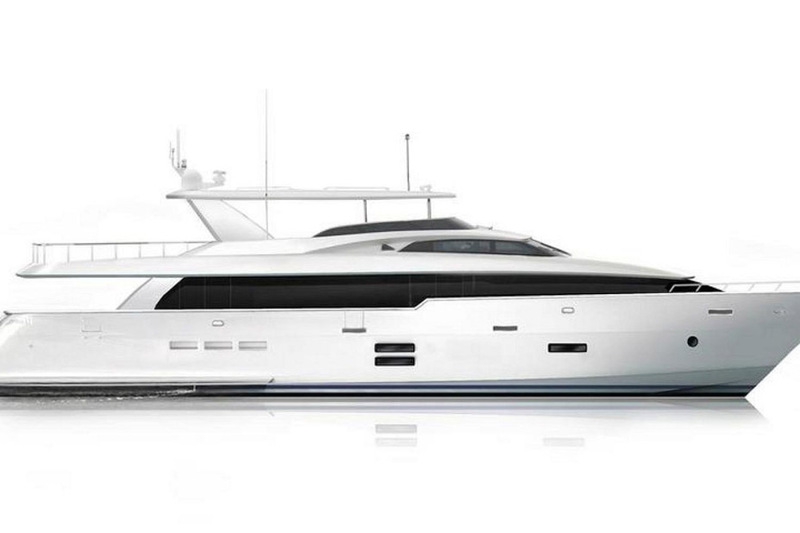 To learn more about the new Hatteras Yachts GT59 sportfish convertible, contact your United Yacht Sales representative.